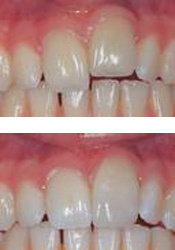 Dental contouring or shaping is something you can do to correct teeth that are crooked, jagged, too long or overlapping. After the procedure is finished, your teeth are better matched in size and shape, giving a better overall appearance and making them seem less crowded. The dentist will determine whether you are a good candidate for this procedure. If you are, you will be amazed at what can be done to improve your smile in very little time, reasonably and comfortably!